Senior forward Kate Allen had multiple opportunities to score against Illinois on Friday, but the Fighting Illini and the posts rejected her. With senior midfielder Julie Sierks’ goal in the contest, she is now tied with Allen and junior forward Katie Langrebe for the most goals this season. Northwestern entered Thursday’s game against Illinois ready for its second consecutive Big Ten win. There was only one problem: Illinois forward Jannelle Flaws. Flaws scored her 16th, 17th and 18th goals of the season to give the Fighting Illini a 3-1 victory over the Wildcats. Flaws’ 18 goals now lead the nation and already tie her atop Illinois’ all-time leaderboard with four games left to play. Both teams came out firing on all cylinders, with four shots between the two clubs in the opening five minutes. The crossbar was a big issue though, as shots by both Illinois’ Nicole Breece and NU senior forward Kate Allen ricocheted off the top post in these early minutes. 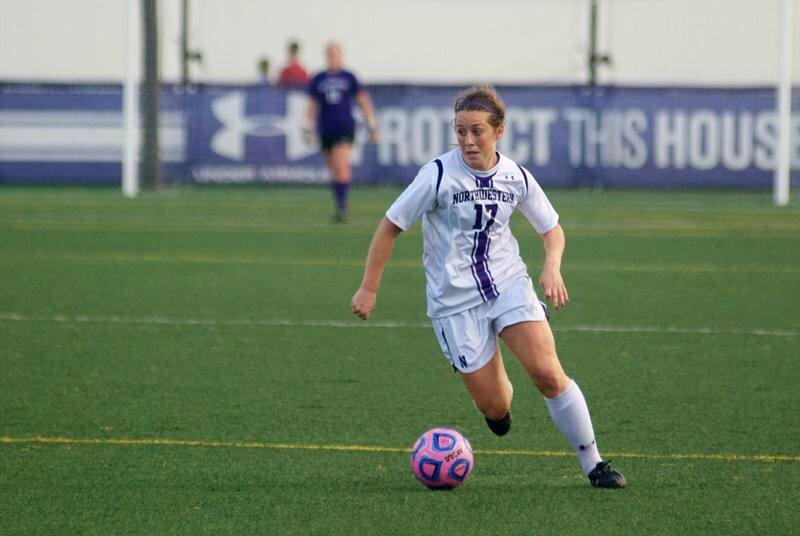 The Cats, however, were able to bounce back and take a 1-0 lead when senior midfielder Nicole Jewell’s corner kick found the head of freshman forward Addie Steiner. Although Illinois goalkeeper Claire Wheatley saved Steiner’s header, she mishandled the ball, allowing senior midfielder Julie Sierks to knock the ball into the net. Sierks’ three goals now tie her for the team lead with Allen and junior forward Katie Landgrebe. NU continued to dominate play for the first 20 minutes with another shot on goal and a corner kick, but the momentum quickly shifted in the Fighting Illini’s favor. And what exactly flipped this game on its head? Two words: Jannelle Flaws. Flaws didn’t show many flaws, scoring two goals in four minutes to give Illinois a 2-1 lead. First, she knocked one into the net off a low field kick from defender Kassidy Brown in the 20th minute; then in the 24th, forward Megan Pawloski found Flaws open from 10 yards out. “She’s always where she needs to be,” Moynihan said. The game lost considerable steam after Illinois’ second goal, with no more shots until Allen knocked one wide in the 38th minute, her second of five missed shots. The Cats left the first half down 2-1. Flaws, however, was not done yet. She completed the hat-trick, making her third goal from long range in the 50th minute off the assist by midfielder Allie Osoba and Brown. Although the game clearly stalled in the second half, the Cats still had their chances. NU, though, fell into its old habit — missing opportunities. The Cats would go on to miss nine shots in the second half, including Sierks nailing one off a familiar foe — the crossbar. Being unable to finish has been NU’s kryptonite this season, and tonight was no different. Moynihan, though, said he thinks the Cats played the better game overall. NU will look to regain its momentum Sunday, when it takes the road to Columbus to face the Buckeyes. This loss, however, will be a tough one to recover from.